It’s not a story I looked forward to writing. 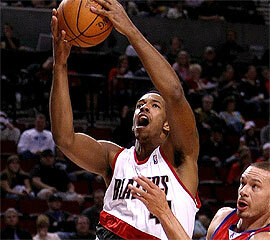 But the conversation had to take place: Channing Frye’s future in Portland. For those of you who have taken the time to read this blog over the past six-seven months, you know my take on Frye. After arriving in New York around the same time and both beginning our careers with the Knicks – Channing play, me writing – we landed in Portland the same summer. It just happens that our paths have intersected more than once. For me, he’s one of the great guys in this league. Always a good quote. Don’t feel bad about calling him goofy either. He calls himself goofy. It was that way in New York. It appears it will be that way in Portland – hence me digging into the idea of his future with the Blazers, courtesy of HOOPSWORLD. Right before the Blazers embarked on their recent road trip back to Chicago, Philadelphia, New Jersey and Charlotte, I grabbed some time with Channing at the Rose Garden. Wanted to get his thoughts on his current predicament. Know it’s not an easy time for him. 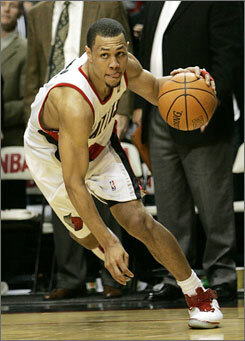 Also know his play has reverted back to when he first arrived in Portland. Many will agree. When Frye is on the court, you almost forget he is. Let me say this – the guy isn’t jaded. He’s not complaining. He’s not sulking. If anything, Frye has read the writing on the wall and doesn’t like what it says. I highly doubt Brandon Roy has “Heart” shuffling on his I-Pod playlist, but after Portland grabbed their first road win of the season against the Orlando Magic, Roy is easily the “Magic Man”. After waving his wand against Houston and Minnesota at home, Roy played his most complete game of the season on Monday night with 27 points – a new season high. Presto. Hopefully the back-spasms he suffered at the end of the game will be gone come Wednesday in Miami. As for Monday night, Portland came out aggressive and finished strong. How many times can we say that this season? While you ponder that one, let’s go inside and outside the box score for the rest of the goods…. – Steve Blake finished with 20 points and went 2-3 from outside the arc. Blake needed this one, perhaps even more than Portland needed a road victory. And it’s not that he scored from all spots on the floor, yet it’s how many of those points came from the charity stripe where Blake went 10-11. That stat line screams one thing – aggressiveness. –Travis Outlaw continued to show his worth by moving to the second unit three games ago. He had 20 points and had it going from outside early and often (3-5). You knew this was coming. Once he found a comfort zone back where he belonged it was only a matter of time before the real Outlaw re-appeared. And that’s a boost about his all-around game, just not his scoring touch. 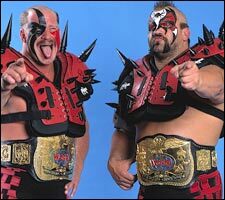 Thanks to Outlaw and Rudy Fernandez, Portland outscored Orlando’s bench 20-2 to open the game. The Blazers finished with 40 points off the pine. – I’m in no way advising Jerryd Bayless’ agent Jeff Schwartz to issue an distasteful edict against Nate McMillan and demand a trade, but it’s certainly helped Sergio Rodriguez’s minutes. After averaging 9.2 minutes per game the first five games of the season, Sergio has logged roughly 12 and 16 minutes respectively the past two games since making headlines for all the wrong reasons. Here’s the thing though – for every one of Sergio’s sweet jump-step buckets down the lane, there’s a pass into the third row that tends to void his in-game success. This just in: consistency counts. His play in the fourth quarter proved that. – Portland only had 5 turnovers (2 in the first half) versus the Magic’s 14….9 steals versus Orland’s 3….scored a season-high 36 points in the first quarter….and shot an impressive 52.9 % from three-point land for the game. James Jones is smiling somewhere. – You knew Dwight Howard was going to get his. Same goes for Hedo Turkoglu. 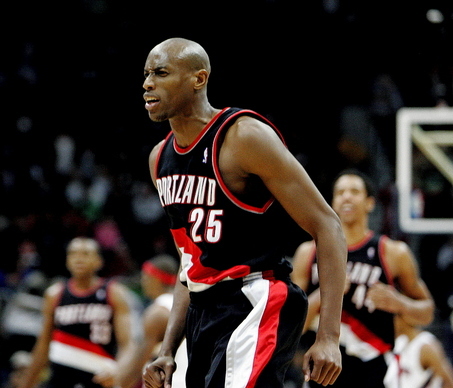 But the fact that Portland played strapping defense – and created fouls – against Rashard Lewis, Mickael Pietrus and Keith Bogans says volumes about Roy and Outlaw – Rudy and Nicolas Batum grasping Nate McMillan’s bigger picture: a defensive mindset. – Play of the Game: Rudy’s three-pointer at the end of the first quarter was pretty smooth. So was Roy’s bobbled-shot against Boguns down the lane in the fourth quarter. But this one goes to Channing Frye for going toe-to-toe against Turkoglu with seconds remaining before the half. After a hard foul on Howard in the paint, Hedo shoved Roy in the back and Frye wasn’t a having it. Words were exchanged. More shoving commenced. Double-technical fouls were issued. But score one for Frye and Portland for finally muscling-up. It’s about time. LaMarcus Aldridge walked towards the court at the Rose Garden and past Channing Frye late last season and basically blew-up Frye’s spot. It was a good couple hours before the game. Channing leaned against a wall just down from the Blazers locker room drenched from a pregame workout. Huffing, he explained how he wanted to return to Portland after a then approaching summer that could have easily seen Frye shipped out of town. Now Frye hopes he can still call Portland home after this season, despite not being able to agree with the Blazers on a contract extension. I broached the topic with both Frye and Kevin Pritchard last week – a story you can read in full over at HOOPSWORLD today…. Where does Frye fit in Portland’s future? I will spare you guys the intricacies of Channing’s game and his likeability off the floor. Those who religiously read his blog or tune in for his radio show on 1080AM The Fan know what Frye is all about. He’s about being real. It didn’t start that way. We were familiar with each other from our days in New York. It was rough for Channing. The Knicks had no clue had to use the guy. The summer he was traded to the Blazers, I returned home to Portland after paying an ungodly amount of rent in Manhattan for three years. Truth be told though, he wanted nothing to do with me when I rolled out to Portland’s practice facility one offseason morning two summers ago. To Channing, I was “one of those” writers from New York. “Yeah, I remember you,” he said avoiding making any eye contact. Oh yeah, I remember thinking. This is going to go reeeaaal nice. Despite the chilly reception, we had a good talk. Anyone who knows Frye knows this: the guy loves to talk. He talked about New York. He talked about growing. He talked about starting fresh. He talked about loving Portland. He still talks about loving Portland. He knows what is he talking about.